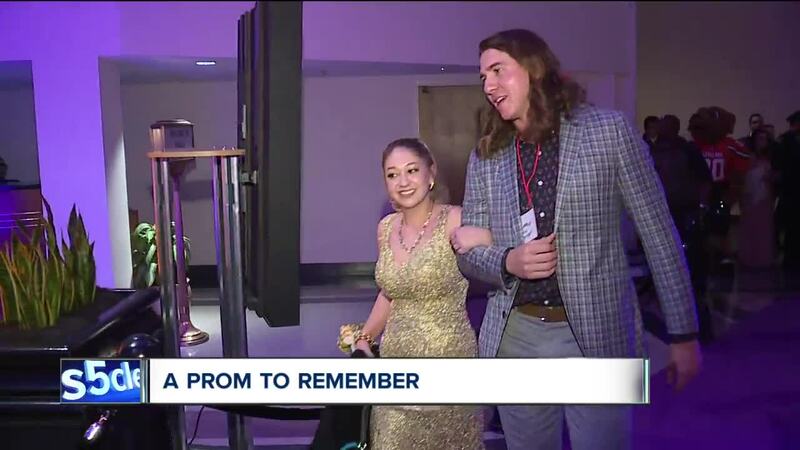 CLEVELAND — Prom is a rite of passage for many and on Saturday, local teens fighting cancer were given a prom they will never forget, one made extra special with an appearance from a Cleveland Indians pitcher. More than 140 teens were provided a special night of celebration at the Ritz-Carlton. Leading up to the event, teens were invited to a Dress Extravaganza, where they were able to shop for their dream dresses from a selection of more than 1,500 donated gowns and even more accessories, all free of charge. American Commodore Tuxedo provided tuxedos free of charge as well. The foundation provided a limousine for the prom-goers to pull up to the event in and a photographer ready to capture their walk down the red carpet. One of the teens who attended “A Prom to Remember” was escorted to the dance by Indians’ pitcher Mike Clevinger. Clevinger was all smiles as he walked down the red carpet with his date to the prom. The guest list was comprised of patients, doctors and nurses from Akron Children’s Hospital, University Hospitals Rainbow Babies & Children’s Hospital and The Cleveland Clinic’s Children’s Hospital. Prom-goers ranged from age 12 to 19. For more information on A Prom to Remember, click here .